Each November, the American Diabetes Association promotes American Diabetes Month to raise awareness. This year's theme is "Eat Well, America!" According to the American Diabetes Association, nearly 30 million children and adults in America are living with diabetes and another 86 million are at high risk for developing type 2 diabetes. The disease is taking a devastating physical, emotional, and financial toll on our country. If you are fortunate enough to not already be battling this disease, please take these preventative steps to help your family stay healthy. Get more physical exercise - Exercise can help you lose weight, lower your blood sugar, and boost your sensitivity to insulin, which helps keep your blood sugar within a normal range. Get plenty of fiber - It may help you reduce your risk of diabetes by improving your blood sugar control, lower your risk of heart disease, and promote weight loss by helping you feel full. Foods high in fiber include fruits, vegetables, beans, whole grains, nuts, and seeds. Go for whole grains - Whole grains may reduce your risk of diabetes and help maintain blood sugar levels. Many foods made from whole grain come ready to eat, including various breads, pasta products, and some cereals. Look for the word "whole" on the package and at the first few items on the ingredient list. Increased thirst and frequent urination. As excess sugar builds up in your child's bloodstream, fluid is pulled from the tissues. This may leave your child thirsty. As a result, your child may drink - and urinate - more than usual. Extreme hunger. Without enough insulin to move sugar into your child's cells, your child's muscles and organs become energy depleted. This triggers intense hunger. Weight loss. Despite eating more than usual to relieve hunger, your child may lose weight - sometimes rapidly. Unexplained weight loss is often the first sign to be noticed. 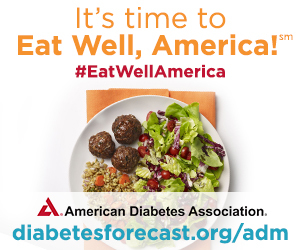 Visit the American Diabetes Association website for healthy meals and treats and information on choosing, preparing, and serving healthy food that is delicious and nutritious. Additionally, Diabetes Forecast is a great resource for meal planning and recipes. Source: "American Diabetes Month." American Diabetes Association. www.diabetes.org. Accessed 10/26/15. Source: "Eat Well, America!" Diabetes Forecast: The Healthy Living Magazine. www.diabetesforecast.org. Accessed 10/26/15.